SOLIDWORKS configurations play a huge role in the way that many companies use the software. When it some to configurations, some companies will choose to use each configuration as a separate part number, while others choose to use the “one file, one part” methodology. No matter which method is in use in you company, you are most likely using configurations in some way, shape, or form. Even users that don’t consider configs as separate parts will most likely use them for simplified representation, alternate position, or one of the other thousands of uses. If your still telling yourself that you don’t use configurations at all, go ahead and create a sheet metal part; you’ll get those configs without even knowing it. So where am I going with this? Well Enovia, if configured out of the box, will create a single part instance for each of these configurations. These instances are the basis for separate parts in the system. The big question is why do I need or want separate instances (part numbers) for each of my simplified rep, flat patterns, ect. The simple answer is you don’t, there is no need. Let’s look at how to tell Enovia that under some circumstances it can just ignore them. The object that we are going to look at is in the config for the SOLIDWORKS connector. 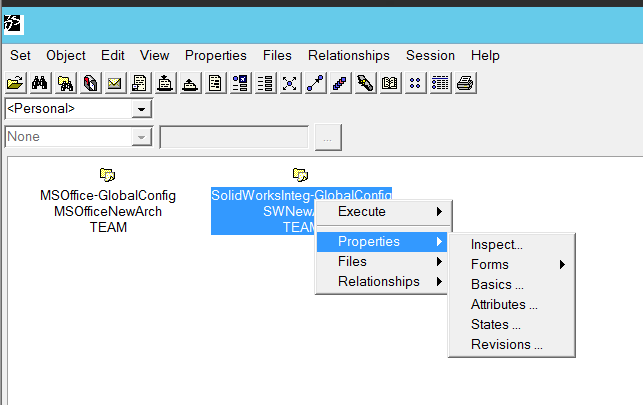 Its type is “SolidWorksInteg-GlobalConfig” and the name should be “SWNewArch”. To get to it, we need to use the matrix.exe executable, and I find that the easiest search in matrix will be to search for *Arch*. Edit the attributes from the right click menu or select the “Attributes” from the toolbar. The attribute in this object that we are looking for is “SLW-ConfigurationFilter”. extension|exclude pattern|include – Extension would be SLDPRT and SLDASM. This example would take any part checked in to the system and exclude all the configurations, except for the include of any configuration that starts with “Default”. This example would take any part or assembly checked into the system and exclude all configurations except for the inclusion of any configuration that is named “Default” or starts with the prefix “PN”. 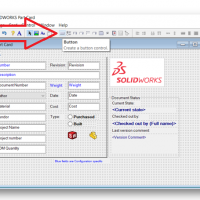 This example would act on all parts and assemblies that are checked into the system and include all SolidWorks Configurations except for any configuration containing “simple” in the configuration name. The configuration of this option in the system goes hand in hand with a few other options that work together to form the basis of your part numbering scheme. We will talk about some of the other options in upcoming blogs.